"I've made it clear that I believe Oklahoma can be a top 10 state in infrastructure, and we are quickly approaching that goal with our highway bridges." Stitt said. "I want to continue this momentum as we address other critical infrastructure needs like pavement conditions and two-lane highways as well." 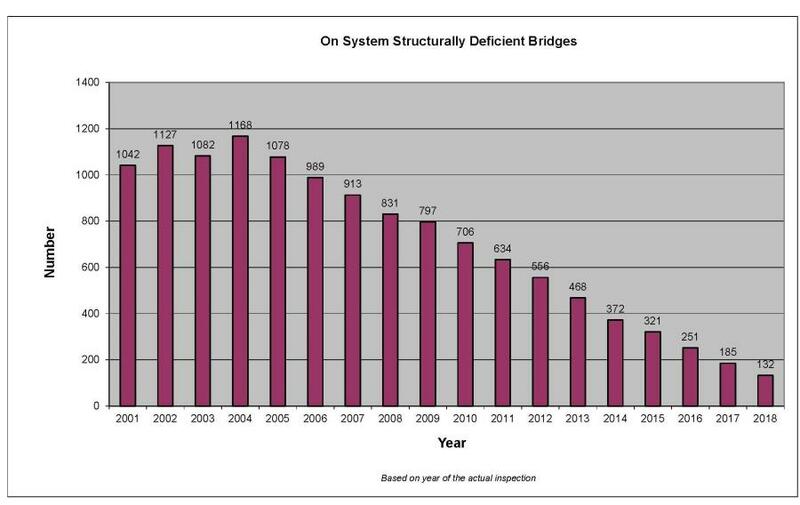 In 2004, an all-time high of 1,168, or a full 17 percent, of bridges were rated structurally deficient and Oklahoma had been ranked at the bottom nationwide in bridge conditions. Through its Eight-year Construction Work Plan, ODOT made the state's bridge infrastructure its top priority and has replaced or rehabilitated more than 1,400 bridges since 2006. Nearly all remaining structurally deficient bridges are either currently under construction or scheduled in the Eight-year Plan to begin construction in the next year. The governor also helped kick off ODOT's statewide work zone safety campaign, themed "In the Game of Cones, Safety Always Wins" in reference to a popular HBO television series. The campaign keeps the overarching message "Your Life Matters: Drive Like It" and seeks to remind drivers that they are far more likely than road workers to be injured or killed in highway work zones. 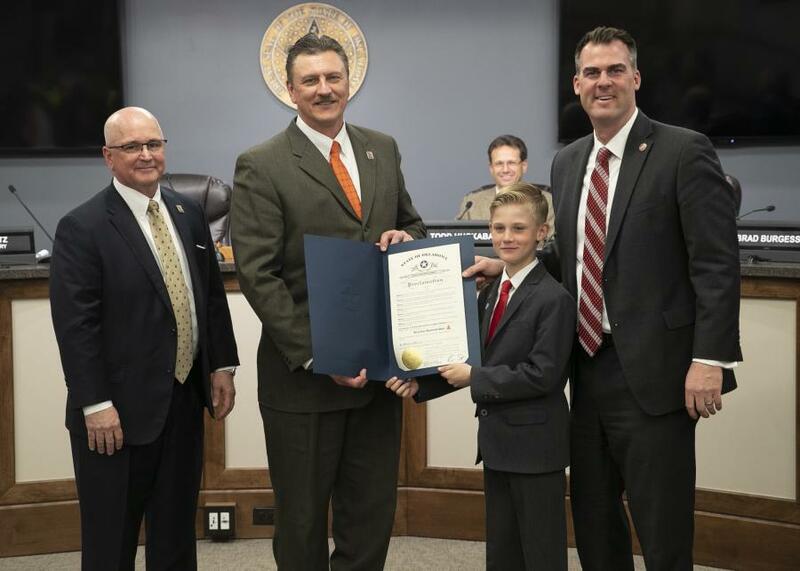 Stitt presented a proclamation declaring April 1 to 14 "Work Zone Awareness Days" and noted that in the past five years, 65 people have been killed in a work zone in Oklahoma, including four ODOT employees. Speeding, following too closely or being distracted by cell phones are cited as the top reasons for crashes in Oklahoma work zones. "I am delighted to welcome Gov. Stitt on my first day as ODOT executive director," Gatz said. "It's very exciting for him to see the progress being made on bridges and to have his support in bringing the public's attention to the major issue of work zone safety." The commission also welcomed newly-appointed District 3 commissioner T.W. Shannon, of Norman, to his first meeting. Shannon works in the banking industry and previously served many years in the state legislature, including as Speaker of the House. As a lawmaker, Shannon chaired the House Transportation Committee and authored landmark transportation funding legislation. As part of the consent docket, the commission approved a speed limit increase on sections of U.S. 54 to 70 mph through Texas County in the Oklahoma Panhandle. The road is primarily a four-lane divided highway and is a major commercial thoroughfare connecting New Mexico, Texas, Oklahoma and Kansas. State Rep. Kenton Patzkowsky was in attendance at the meeting and praised the speed limit change. Commissioners awarded a $20 million contract to reconstruct the I-44 interchange at 163rd East Ave. in Tulsa and Rogers counties. The project will complete the widening of I-44 to at least six lanes between the I-244 eastern junction and SH-167/193rd East Avenue. They also approved several contracts for highway resurfacing projects, including more than 5 mi. of U.S. 70 west of Durant; 6.5 mi. of U.S. 62 west of Chickasha; and 8 mi. of southbound U.S. 75 between the Tulsa County line and SH 16 near Winchester in Okmulgee County. A list of all awarded contracts can be found by visiting www.odot.org/contracts/, selecting the March 2019 AM letting, clicking Go, then Award. The commission's next meeting is scheduled for 11 a.m. May 6. For more information, visit www.odot.org.